When I started counting PointsPlus again on Wednesday, I decided to switch from the usual weekly tally to a daily tally. Normally on Weight Watchers, you keep track of your daily PointsPlus and you get a weekly allowance (49 PP) to use any time during the week that you'd like. This works out really well if you have an event coming up, so you can hoard those PP for the event; but I've discovered it to be a problem for me, most of the time. Since I've been having such a hard time staying consistent with counting PointsPlus, I decided to change it up a little. My week usually goes like this--great counting Wednesday through Friday, and then usually go WAY over on Saturday and Sunday, and then Monday, I think, "Well, Wednesday will start my week over, so there is no point in counting Points now..." (If you've done WW, I'm sure you may be able to relate to that thinking?). This has caused my weight to stay within a 3-5 pound range for about a year now, rather than losing weight. Basically, if I have a bad day (or meal) and blow my Points for the week, I find it really hard to get back on track until Wednesday. So, to remedy that problem, I changed up the way I distribute my Points. I set the tracker to give me 33 daily PP (my usual 26 + 7 weekly); and I set the activity Points to where they must be used the day I earn them. So if I earn, say, 10 activity PP today, then I would have a total of 43 PP to spend... today. Tomorrow, it would go back to 33 + the number of points I earn for activity. By doing it this way, each day works in and of itself--a fresh start. (It's very similar to counting calories.) I think this will help me to stay more consistent; and even if I have a bad day, I won't be waiting a few days to start my week over. The only downside is that if I have an event where I want to spend a lot of Points (50+), then I won't be able to "save up" for it. Those events are very rare, though, so I don't see it causing a problem. For the past year, I've been trying to get back to a very consistent regimen, like I did the entire 16 months I was losing weight. I never went over my points then, because I learned to plan things out and work all my food cravings into my diet. But for some reason, I've been having the hardest time getting back to that. So, my main focus right now is just staying consistent with my tracking--always tracking, even if I go over. And I'm hoping that by doing daily tracking (versus weekly), it will help me to have more consistent days each week. Finally, I talked myself into going by promising myself that I could do it like a "light jog"--very easy pace. Last week, I did my long run with Jerry before I left for Portland. We thought it would be a good way to spend some quality time together before I left, and we took the pace very easy. Between the chatting and the icy path at the State Park, our pace was 11:22/mile. I didn't even look at our pace until we were done, though. So today, even though I was running solo, I decided to just run it comfortably without any goal at all. I had planned on doing an out-and-back, but once I got about halfway down my street, I realized I didn't have my phone with me. I didn't want to go back in to get it, because Joey would think I was back home for good (I always feel bad about leaving him, and he gets so excited when I get home). I didn't feel comfortable going that far without my phone, so I just stuck to the neighborhoods around my house. 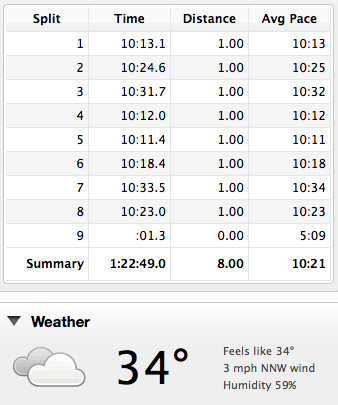 My pace wasn't very consistent, but I wasn't focused on it at all anyway. It was a little faster than the "light jog" that I'd imagined, but it was comfortable. I was kind of surprised at how fast the first half of the run went. I decided to stop by my house and pick up Joey for the last two miles. He was thrilled when I came in and grabbed his leash and harness. He was really good at heeling today, staying right by my side for a good portion of the run. Then when we hit mile eight (for me, not him!) we walked for another quarter mile so that he could stop and sniff and pee on things. Tonight is his last obedience training class. I'm kind of bummed! I've really enjoyed the class, and Joey has done awesome with it. He listens to Jerry and me, and even the kids, really well. He still needs a lot of practice (mainly in distracting environments), but the class definitely helped us to know how to train him. I'd like to continue with more advanced training, but I'm not sure where to go from here, so I'm going to talk to his trainer tonight. Congrats on the great recovery. It's fabulous. And yay for running with Joey! Clearly he's having a ball. Not wanting to be telling you what to do, but can I make a suggestion? Check out The Harcombe Diet. If you're not getting the results you want/need on WW, and you're looking for ways to drop some fat, and maybe even a way to live your life with less mental clutter, this could be the go. The science is sound, it's all about eating really seriously healthy food, and eliminates the pressures of counting and worrying. It's about developing a trusting relationship with yourself and food -- and has achieved some astonishing results with very little pain. Also, on the theme of less stress, more enjoyment -- maybe it would be good to spend a little time using an inside-out approach to your running. IOW, don't be so focussed on external schedules, external goals, rather let how you feel on any given day dictate how far/fast you run. When you're feeling brilliant, push it. When you're feeling a little dodgy, dial it back. I mean, I know you do adjust things but it seems to me you beat yourself up a fair bit because you didn't do what you 'should have' or had decided ahead of time to do. That's applying an external authority. Trust yourself. Trust your body to tell you what it wants to do. Perhaps there's a bit of fear still lurking, that means you're afraid that if you don't impose a rigid external schedule on yourself you'll morph back into a couch potato. But fwiw, nothing I read here suggest you're that person now. I think you're a brand new person now. Maybe it's time to start trusting her voice more than the outside voices? Love your idea with the WW points. I'm going to try it too! Thanks! Hope the new routine of tracking works wonders for you! I found its good to switch things up every once in a while, myself! You are such a good dog mom! I am jealous that Joey runs so nicely with you, Molly hates it (I guess she did her running at the track and is officially over it) so I can never take her with me. I hope your new points method works better for you, sometimes it takes just tweaking and experimenting with a few things to find that happy place again. I've had the worst time getting back on track and am going to experiment next week with some stuff to try to get into the groove again! Good luck with the tracking. I found calories in, calories out and points worked wayyyy better in my 20's and early 30's. Now in my super late 40's!! !, I've got to mind my macros- too high of carbs and I won't sleep at all. I track now for long term weight maintenance AND almost more so for sleeping like a baby. I can take 2 days, 2 weeks, or even 2 months off food tracking, but slowly my weight will keep. And the sleep, oh, how I love sleeping well. Good luck on the tracking. Here's to finding what works. Hi Katie! I'm having the same consistency problem as you & would like to try your suggestion. Are you just dividing the 7 Weekly Points out in your head (allowing yourself to go over your Points by 7) or did you change something in the settings to do this for you? I have a theory about not being able to "get back on track" and I take this from my own experience. Your mind is subconsciously "OK" with where you are weight wise now. and that's why it's so hard to put in the extra effort to do so much tracking etc. I have seen the pics of you and I think you look like a perfectly healthy weight, you look happy and healthy and don't look like you are overweight to me at all. Maybe your mind already knows what the rest of us see that you don't yet. If you had a minute, could you explain how to set your track to daily on the WW app? I'm so non-techy. Also, I did have good weekly tracking success by changing my weigh in day. My week starts with Saturday. A few weekends of eating high points and leaving me with so few for the the rest of week, and I quickly learned to curb the higher point items until I was sure I was going to make it through the week. Anyway, I started counting points again when you wrote that post about just getting it over with and I am down 11 pounds in 9 weeks now. :-) It's just what I needed to hear. And that's AWESOME you've lost 11 pounds already! I'm so glad that it resonated with you. I'm having the same issues with being consistent. I lost about 25 lbs on WW in college, and of course have gained it back and then some. Not losing weight as easily now [about 5 yes later] and feel much less motivated!